This one has been done with with 254px captures (note it means to be 397 meters long). PS: I think I'll need bigger docks (the crane looks nice! ), and bigger depot window! PS2: Why is the tonnage modified? I promise in the DAT file I wrote 170,974t. Where does those 39,902t comes from? Anyway, here's the pak for the Emma Maersk. Available from 8/2006. Using some x and y offset to center them on a pak128 may help to allieviate some of the biggest graphical issues connecting with those giants. I guess Zeno already used them on some views. The problem is that a ocean ship like this doesn't belong to canals - and with its size it looks plain horrible in turns, no matter what. Oh yes, it would be great to restrict to enter canals or not, even restricting minimum dock size or similar, but I guess it's not possible by now... Anyway, if you don't tell it to sail into canals... it won't do by itself! Very nice boat, but it can travel true canals it takes the Suez canal on it trip to China form Europe, it would be kinda a stupid to take the de tour down to South African and take the risk at Cape Agulhas. But if you look at the Knock Nevis then Emma Maersk is quite small. MS Oasis of the Seas or MS Freedom of the Seas would be nice to have as well. Since we do have canal bridges, and while current ships in 128 can use them and not look that bad, differentiation between seafaring craft and inland barges et al would be good. Ah, I don't see dose as canals rather small waterways . But have to try that I has to look quite cool, but the simutarns canals has to be quite big as well is every square is 1 KM or so. Heh. Perhaps I went too far with these links, but I couldn't find anything better at that point. I'd love to see ships like this in 128, too, but the requirements are quite a lot higher than for planes - these need just a wider runway and that's all in most cases. I like the idea. (I had already thought of trying something like myself one day). And I don't really see a problem with canals - any player who uses this type of ship on a canal (simutrans, not suez ) deserves what he gets, IMO . Well, I am not fundamentally opposed to their existence... it's just... dunno. Well not everything that exists needs to be part of the official pakset. There's always the status "addon". Sometimes we tend to forget that. Yeah, the planes are much more fun, and they are much better then the pak planes so. I was not economical as a canal ship either I had to small margins just 50 %, but it was kinda cool seeing it driving and flying on the high way. Meyer Weft dose mostly roll on/roll off ferries they are not so big, but it can't be that hard to drive it when most new boats has ABB Azipod. And if you compare them to the ships built in Turku Finland then they are quite small, but there is much greater room but the water is quite shallow and full small islands. Meyer Weft dose mostly roll on/roll off ferries they are not so big, but it can't be that hard to drive it when most new boats has ABB Azipod. And in case you didn't notice: this was not about the overall size (I never said they were the biggest) but about relative size to the river - never even saying that this was the only place or the worst ratio between ship size and river size. I just gave one example. 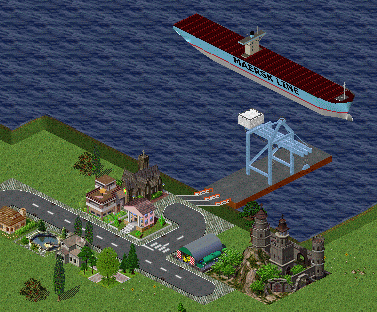 Which was BTW linked to the discussion about ships in simutrans looking too big for simutrans canals. And at least on the wikipedia shiplist (just a selection, but none the less) for Meyer Werft there are over 20 Cruise ships mentioned and just one ferry (judging by the names of ships and companies, I haven't looked them up) - so claiming that they do "mostly roll on/roll off ferries" (and even if they did, it wouldn't change the fact that they build quite a number of fairly large cruise ships as well) is probably a bit off the mark. I did not see the 315 meters ship but now I have, but if you see most of them are 290-295 meters. The biggest ship class in Turku are 360 meters and the beam is 47 meters and 8 Wärtsilä V12 Engines . So the build those in Papenburg and the smaller ships in Rostock, I would do the opposite. Yes, but even "only" 290-295m is a very large ship if you happen to encounter it on a small river more than 30km away from the sea, isn't it? And that's what this was all about. Where can I find this blue terminal to 128? Sorry, it's only in pak64. We have a few things about ships to 128,a few days ago I've found the Emma Maersk to 128 and a super oil tanker,but only this. Can Emma Maersk be the super oil tanker? You can find the Emma Maersk at the first page of this topic. Yes I have this two ships,but I want to find new ships and terminals and is very hardous to find this.